All the latest news about new releases of the Glow Blog Service. These were small maintenance and bug fixes. They should not affect the majority of Glow users. We will be having and update of Glow Blogs this afternoon/evening. Work will start at 16:00 and service will be restored as soon as possible thereafter. Here is an overview of the update, we will be posting details of any changes to the help ASAP. There are new Text, Image, Audio & Video widgets More details and examples. Adding and editing links is now a better process. See the Version 4.8 on WordPress Codex for more details. There was a new release on the Glow Blogs Service on Wednesday 07th June 2017. Following are the main components of the release in addition to bug fixes and routine backend maintenance work. Auditing – Addition of wp_stream plugin that will audit various activities on blogs (this will not affect blog users). Help is being added for these features and will be linked above as it is created. Glow Blogs now supports email notification for comments. There was a new release on the Glow Blogs Service on Tuesday 28th February 2016. Following are the main components of the release in addition to minor bug fixes and routine backend maintenance work. Blog admins will receive email notifications of any comments on their blog posts if they have chosen to receive them. Blog admins will be able to view Google analytics data related to their blog. Upgrade to WordPress version 4.7.2. Syntax highlighting Plugin, will allow pretty display of source code in posts. NB, the Add Users feature this release has been rolled back. A bug in the RM unify api prevented the selection of pupils via year group. We will reinstate the change when the bug is fixed. There will be a new release on the Glow Blogs Service on Monday 09th January 2017 between 4:00 pm and 5:00 pm. The main focus of the release is a change to the data that is available on the Add Users screen. Blog administrators will now be able to bulk add users to a blog by selecting and adding year groups and registration groups in addition to the existing teaching groups, if they have been setup in SEEMiS. This will be particularly useful in primary schools as they generally do not have teaching groups in Glow. Manual addition of users to blogs will continue to be available as now. Help will be added for this change in the Glow Blogs Help blog once the functionality is live. We will update the Adding Users, Setting Roles page here on the help blog as soon as possible after the release. New Captcha Plugin on Public Blogs, a Captcha system has been added for non-logged on users on public blogs, this should cut down on spam. 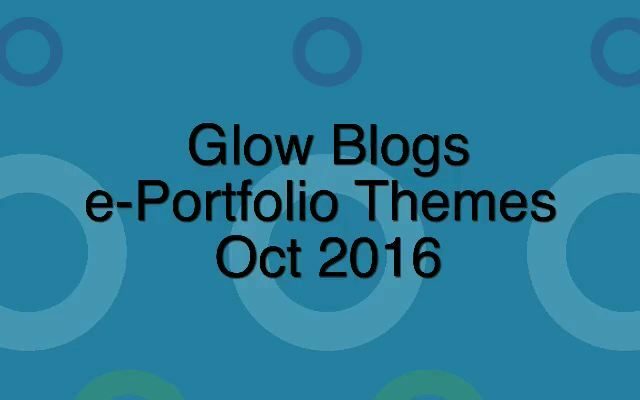 The October Update for Glow blogs has arrived. It includes the following, help will be added for these features over the next week and this post updated. Ability to Edit Profile Tags. In the Dashboard go to Posts-> Profile tags. This will only be available on blogs with the e-Portfolio plugin activated. The e-Portfolio Tags help page has been updated with details. Profile tags can be displayed on the sidebar with the tags widget. ‘Like’ and ‘Follow’ buttons from Yammer can be added to posts. See Settings->discussion to add these buttons. You will see them on this post. A rating plugin. Add [ratings] to a post to show a ratings facility. See below.